I honestly think I’d rather see LUKE Cage than Nic Cage right now. Right now Nicolas Cage is everywhere. It’s hard to turn on the TV and not see his long, thin mug. At the moment, he’s got two movies out… The Ant Bully, and World Trade Center, in which he adds a creepy moustache to his physical repertoire. He’s been doing interviews galore, “waxing philosophical” if you will, about the September 11th melodrama, and the merits of “storytelling about history” as opposed to “entertainment”. Not that he doesn’t have a point at all, and I’ve heard mostly good things about the movie, but his pompous attitude is enough to make you wonder what Tom Cruise and Ben Affleck are doing at the moment. But I just gotta say thank God he no longer has the moustache. It’s been replaced though, with this long, straggly hair, that I can’t find the picture of right now but might have to do with one of his next movies, or maybe he’s taken on some work as an old-age Elvis impersonator. But in case his grandstanding, pompous interviews for “WTC” weren’t enough, I just started seeing commercials for his NEXT movie, a sure-to-be crappy remake of a terribly over-dramatic British suspense-“horror” movie from the seventies, called The Wicker Man. 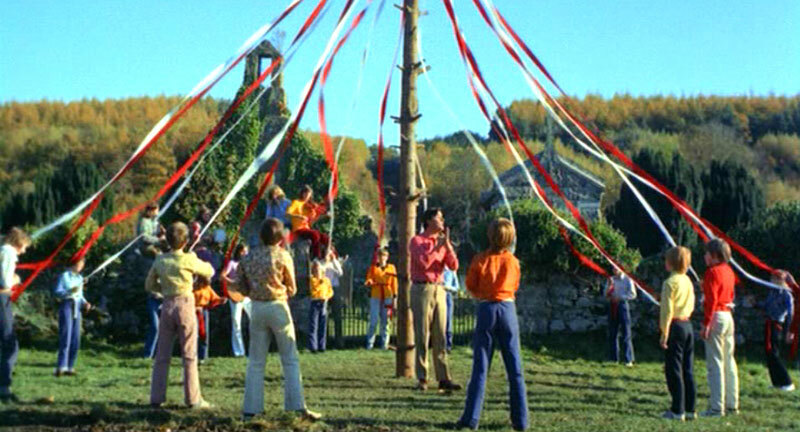 Now, I’ve seen the original, and I have a feeling that audiences are going to loooooove this movie, because there’s nothing that Americans find scarier than a bunch of pagans dancing around a May-pole with masks on. OOOOOOH. Don’t worry. If you haven’t yet seen the commercial, I’m sure you will soon enough, and over and over again. It will be in movie theatres in about three weeks. By all counts, Nicolas Cage could have three movies out at one time. Who does this guy think he is? Will Ferrell? You’d think three movies at once would be enough. It probably isn’t, because I’d be willing to make a bet that when you go see The Wicker Man, you’ll probably see the new trailer for Ghost Rider, Cage’s “been in production for five years” superhero movie about a guy who rides around on a skull-and-bones motorcycle fighting the brooding neighbor from American Beauty. It’s directed by the guy who did Daredevil, and wrote Jack Frost and Big Bully. Okay, so the guy also wrote Grumpy Old Men, and did that Simon Birch movie, but citing them does not suit my needs. Ghost Rider is due in February. The point is this: I am sick of seeing and hearing Nicolas Cage. I don’t hate the guy. I do know people that do, but I happen to like Matchstick Men, Adaptation, the first half of Snake Eyes, The Rock, and theoretically Face/Off, Con Air, The Weather Man, and Raising Arizona. Lord of War was alright, but he’s been in his share of bad movies too… really bad movies. The thing is, he can be really grating when you’re over-exposed to him. When he’s all over the place. And it just seems to be getting worse. One movie in 2004, two in 2005, three in 2006, four on the slate for 2007, and already four on the slate for 2008. Next up after Ghost Rider, is appropriately titled, Next. After that, Time to Kill, and of course the “obligatory” National Treasure 2… I guess the founding fathers didn’t bury all of their treasure in New York… or they had two treasures. In any case, there goes Washington never telling a lie. The ubiquitousness of Nic Cage gets two stars because I am fed up with seeing him all over the place. It could be worse though, and the movies that Cage is doing aren’t all that terrible. I would much rather see more entertaining and versetile actors appearing in 5 major movies a year.